As all Alishan missions it is easy and a bit boring. I did it with Fritz, my musician main, the first time when he just reached level 110. His witch could kill (nearly) all normal monsters with one meteor strike (level 60, shimmering necklace, level 2 charms). Even the traps are mostly harmless: you can trigger them without being flooded by hostile monsters. “All storages” = the two huts marked “hut” in the map. That is the boss – and your mission is completed when he dies. When you get near the boss (that is: pass the last set of stairs) a cut scene ensues which lets spawn two groups, each consisting of two very weak monsters. 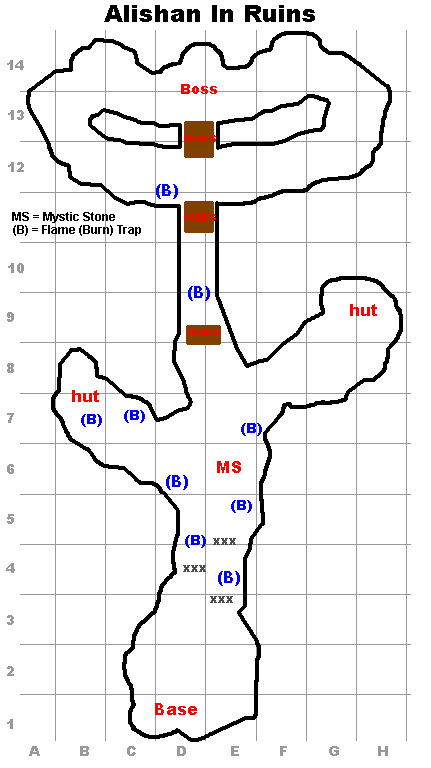 Please add any trap locations I missed in the comments. Here is a video about my very first run of this mission with Fritz. There are some rough edges and I was more careful than I had to be but this strategy (if you want to call it so, it was simply “push ahead and kill”) works. Update 2011-11-01: Found the D6 trap finally. Map is updated. isnt this one the TBS of Taipei? I got this one on my first try, it was VERY easy, even with the ungodly amount of burn traps around. I decided to help my fiance with this and we’ll see what happens–his tbs mercs are severely underleveled, but so far we’ve tackled FB and No Safe Harbor (with 30 seconds to spare on NSH, I have a new found hatred for that place). What’s the difference between the solo mode an the squad mode?? in terms of difficulty i mean. Solo mode: You can only do it solo, have time until the world freezes over (example: The Shaman Returns 2 hours instead of 60 minutes), there are less monsters and sometimes summon portals are omitted. There is a burn trap at E12, it’s like the one on D12.